We have discounts available for both our online and onsite training courses for the care sector. For onsite training at your premises we will bring all the necessary training equipment to conduct training and help you stay compliant with your workplace training requirements. We offer onsite training for care homes in Essex, Suffolk, Norfolk, London, Hertfordshire, Kent and UK wide, please contact us to discuss your training requirements. When you register for any of our online training courses you will be able to receive a discount from the training offered. 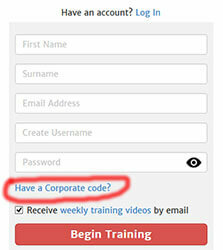 On registration enter the corporate discount code: UK-OLFA1 as shown in the registration screen shot on the left. The discount will be applied at the payment page. If you would like to contact us to corporate group training rates for care homes and agencies and the company dashboard facility that we offer please contact us through our contact us page.